The development of the field of synthetic metal-containing polymers - where metal atoms form an integral part of the main chain or side group structure of a polymer - aims to create new materials which combine the processability of organic polymers with the physical or chemical characteristics associated with the metallic element or complex. This book covers the major developments in the synthesis, properties, and applications of synthetic metal-containing macromolecules, and includes chapters on the preparation and characterization of metal-containing polymers, metallocene-based polymers, rigid-rod organometallic polymers, coordination polymers, polymers containing main group metals, and also covers dendritic and supramolecular systems. 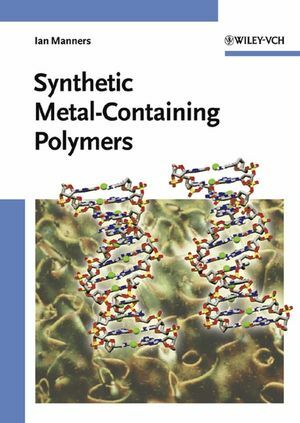 The book describes both polymeric materials with metals in the main chain or side group structure and covers the literature up to the end of 2002. Ian Manners is Professor of Chemistry and Canada Research Chair at the University of Toronto. He received his Ph.D. in the area of transition metal chemistry in 1985 from the University of Bristol, England. After working as a Royal Society Postdoctoral Fellow in Germany in the field of main group chemistry, and then the USA in the area of polymer science, he moved to Toronto in July 1990. He was promoted to Full Professor in 1995. Professor Manners’ research interests focus on the synthesis, properties, and applications of inorganic molecules, polymers, and materials. He is an author of over 300 publications and holds or coholds 11 patents. His awards includes an Alfred P. Sloan Fellowship from the USA (1994-98), a Corday-Morgan Medal (1997) from the UK, and the Alcan Award (1999) and the Macromolecular Science and Engineering Award (2003) from Canada. He was also awarded the Steacie Prize in 2000 – the top award in all areas of science and engineering in Canada for a person aged 40 or older – and he was elected to the Canadian National Academy of Science in 2001. He currently serves on the Editorial Advisory Board of 8 scientific journals. "For any worker in this field, Manners' Synthet Metal-Containing Polymers will be indispensable and for anyone interested in the area it will serve as an outstanding resource." "This informative text by Ian Manners is an important offering to the interdisciplinary metallopolymer field both for experts and newcomers alike...is both an invitation and a thorough introduction to the metallopolymer field. One cannot help but thank Ian Manners for sharing the fruits of his efforts with this impressive volume and helping to forge the way."